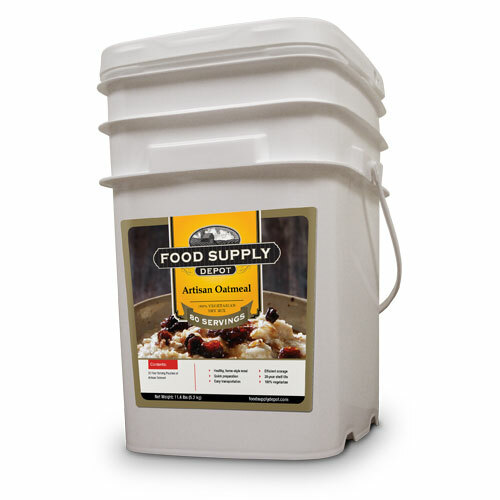 Breakfast Variety Bucket Our Breakfast Variety Bucket provides 27,420 calories filled with nutrition and taste. All four meals are low in saturated fats, high in complex carbohydrates and full of satisfying flavor. Get your day started right every day of the week. Choose from either Artisan Oatmeal, Harvest 6 Grain Cereal, Honey Almond Granola or a heaping plate full of sizzlin Texan Sunrise Skillet. Features: Artisan Oatmeal: 7 individual pouches totaling 6440 calories. Harvest 6 Grain Cereal: 7 individual pouches totaling 6160 calories. Texan Sunrise Skillet: 6 individual pouches totaling 5520 calories. Honey Almond Granola: 6 individual pouches totaling 9300 calories. Only needs water and a few minutes of cooking to prepare, excluding Honey Almond Granola. Individually packaged in family-sized pouches (approx. 2 adults/ 2 children). 3-ply mylar pouches have the sealing power to keep freshness in and the pests out. Oxygen extraction procedure that further protects nutrition and taste. Easy, re-sealable lids that allow opening and closing without unnecessarily exposing the other pouches to air. Convenient handles and sensible weight for easy transportation. Interlocking bucket design that makes stacking easy and stable. For less than a drive-thru value meal, our mouthwatering entr???? ?es nourish your body and comfort your soul.